Two hours from the western edge of Rocky Mountain National Park, this little mountain town is a natural add-on to your national park vacation. 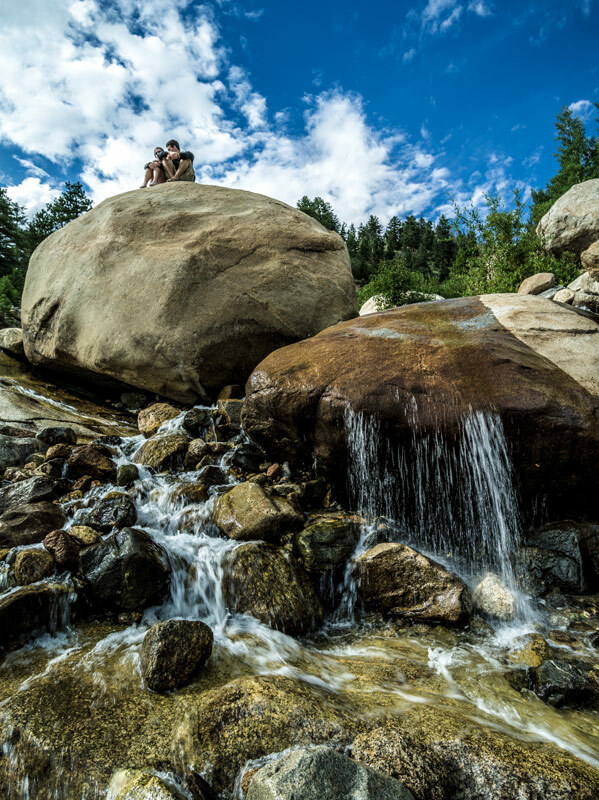 Here are the hidden gems and family-oriented activities, from locals&apos; favorite hikes to tasty restaurant treats for a perfect 48-hour getaway in Breckenridge. A favorite way to start off the Breckenridge experience is by doing a morning hike in the mountain alpine. The Bakers Tank Trail along Boreas Pass Road is a fun hike to do for the entire family. The hike starts off at the trailhead parking lot at the top of Boreas Pass Road. Visitors can either park their car and walk up a single-track trail to Bakers Tank or keep driving three miles along the road to get there. Alongside the road, various beautiful sights can be seen on the way to the tank. Stop to gaze at Goose Pasture Tarn (a glacial lake) along Boreas Pass Road three-quarters of a mile away from the trailhead parking lot. Depending on the season, the drive or walk up to Bakers Tank reveals grand sights of aspen leaves changing colors. Here you&apos;ll find plenty of primitive camping space on national forest land for people willing to spend the night away from the town. There are no toilets or formal campground but the camping is free. Eventually, after roughly three miles of hiking, Bakers Tank is reached. During the time of the Gold Rush, Bakers Tank offered a water source for narrow gauge trains along Boreas Pass. An early morning hike is a great way to start off a Breckenridge vacation, but after several hours hiking an energy-replenishing meal is on the menu. A Breckenridge local favorite is Downstairs at Eric’s. The family fun American food restaurant was founded in 1989, making it a hit spot to enjoy an excellent lunch or dinner. Eric’s offers an arcade room for the kids compiling of over 25 arcade games. The restaurant also has 29 HD televisions so you can watch your favorite sports. The long-term local owner Eric Mamula is also the mayor of Breckenridge. His high spirit makes Eric’s a great place to enjoy a family meal. If you&apos;re craving Italian food, Giampietro’s caters the best in town. The local’s favorite Italian restaurant offers delicious pastas and pizzas. Recently, the restaurant expanded to include a magnificent bar in the back as well as more family seating. Giampietro’s is located on the corner of Lincoln Street and Main Street, making it a spot that cannot be missed. For families looking for a high-end style of dining, there is no place like the Hearthstone. Within the Victorian-era house, people can enjoy elegant dining while having grand views of the Town of Breckenridge as well as the ski resort. Fine meals from elk steak to lobster tail can be enjoyed at the Hearthstone. With a luxury wine list, elegance lies at the Hearthstone. Rocky Mountain Underground in Breckenridge. After enjoying a nice lunch, it may be time to settle down for a few drinks. The locals’ favorite spot, Rocky Mountain Underground, provides a groovy twist to the drinking experience. RMU is a local ski company producing ski outerwear and equipment that can be seen all across the slopes. The new shop includes an attached tavern allowing tourists and locals to shop for their favorite gear while enjoying a cold one. The courtyard at Rocky Mountain Underground. Not only does RMU offer a shop and tavern—they also include a back courtyard with an outside bar. There, people can play games like corn hole while enjoying a nice cold beer. The purple painted building is hard to miss making RMU a great place to go. An excellent way to spend the afternoon in Breckenridge is to visit the Breckenridge Arts District located on Washington Avenue right off of Main Street. The area contains many art studios including a ceramics studio, a textile studio, a metal working studio, a painting studio and more. Visitors can sign up for art classes and learn various skills from local artists. Even if art isn’t a person’s forte, a stroll through the district is a wonderful experience. Historic wooden buildings structure the district—showing off history from the 1800’s. Stop at the Barney Ford House Museum to witness life in the 1800’s. The house today can be toured by families interested in learning about the runaway slave Barney Ford and how he became a well known civil rights leader. One of the most exciting things to do in Breckenridge is to visit Epic Discovery on Peak-8. By taking the Breck Connect gondola located in the center of town, visitors can easily access the fun park. Epic Discovery hosts many fun activities for family members to enjoy from an alpine slide to a bungee trampoline. “Out of the ones I’ve tried, the trampolines are really fun! I’ve also heard people say awesome things about the alpine slide,” Breckenridge employee Nick Barnes said. Other activities such as mini-golf and a roller coaster can be enjoyed at Epic Discovery. Ride the scenic chairlift up to the alpine slide at Epic Discovery in Breckenridge. Alpine slide at Epic Discovery in Breckenridge. While spending the day in the park, visitors can also hike up Peak-8. The moderate hike displays beautiful sights of the town as well as the park below. Hiking at Epic Discovery in Breckenridge. Hours of fun can be spent at Epic Discovery. Kids are able to enjoy the summer sun while playing within the park. The base of Peak-8 also includes Ski Hill Grill, which offers food and drinks. The last hidden gem of this insiders guide is the Country Boy Mine. Founded in 1887, Country Boy Mine became one Colorado’s most influential gold mines. The legendary Tom’s Baby—a 13.5 pound gold nugget was found just up the valley from Country Boy Mine. Today, Country Boy Mine is no longer an active producing mine, yet still operates offering tours to tourists seeking an opportunity to learn history of the gold rush times. Touring the Country Boy Mine in Breckenridge. The tour of Country Boy Mine allows people to go deep within the mine. While traveling deeper into the mine, temperatures drop to around 45 degrees Fahrenheit. While this may seem cold, these temperatures stay the same year around. Miners would have to work long hours in pitch-blackness within the mine. “Now every man is moving around 53-tons of rock a day so as they are coming in here they are going to be riding in and out of this place about 106 times each day through these tunnels,” Sansevieri said. Tour guide Risa Sansevieri pans for gold at the Country Boy Mine. After a tour of the mine, families can also pan for gold outside of the mine. Experts give a great demonstration on how to properly pan for gold, as well as inform people what to look for. The best part of Country Boy Mine is that if gold is found—it is finder’s keepers. A bull moose strolls up Peak 9 in Breckenridge, Colo.
Another secret about Breckenridge is that it is a prime area to see wildlife—especially moose. And dusk is one of the best times to see them. Colorado’s moose population is on the rise with around 2,000 in the state. The best places to see moose are in marshy wetlands and around lakes such as Breckenridge&apos;s Cucumber Gulch Wildlife Preserve between town and the Breckenridge Ski Resort. Breckenridge, Colorado, is an amazing place to spend a weekend vacation. From hiking in the high country to exploring a historic gold mine—Breckenridge has it all.